When 91% of the public thinks the country is on the wrong track, it’s usually a good sign for the opposition’s electoral hopes, and as Pakistan prepares for parliamentary elections on May 11, supporters of two major opposition parties are feeling optimistic. Moreover, as a new Pew Research Center poll highlights, the leaders of those two parties are getting positive reviews from the public. Two-in-three Pakistanis have a favorable opinion of Nawaz Sharif, a former prime minister and leader of the largest opposition party, the Pakistan Muslim League-Nawaz (PML-N). Sharif is especially popular in Punjab, the country’s most populous province. His ratings have been consistently positive over the last few years, and many observers believe the elections will sweep his party back into power. However, the wild card of the election may be Imran Khan from the upstart Pakistan Tehreek-e-Insaf party (PTI) . The former cricket star – in 1992, he led Pakistan to its only World Cup championship in the sport – has shaken up Pakistani politics in recent years, with massive rallies and a message that appeals to many who have grown frustrated with the status quo in a country plagued by violence, corruption, and a poor economy. And Khan hasn’t shied away from anti-American rhetoric, which could be a political winner in a nation where only 11% have a favorable opinion of the United States. At a rally last weekend, Khan said all Pakistani politicians are “slaves” of the U.S. and that he would shoot down American drones if they entered Pakistani airspace. 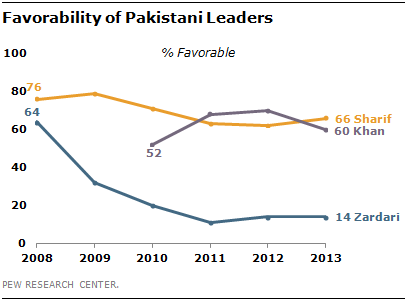 Six-in-ten Pakistanis express a positive opinion of the PTI leader, down slightly from 70% a year ago. But Khan’s biggest challenge may be converting his personal popularity into votes. His party, which in previous elections has been able to claim only one seat in parliament, doesn’t have the geographic base, party machine, or longstanding patronage networks that the two leading parties – the PML-N and Pakistan Peoples Party (PPP) – have developed over the years, so it’s unclear how many seats the PTI will be able to win. Meanwhile, ratings are abysmal for incumbent President Asif Ali Zardari from the PPP, which had a majority in the most recent parliament. Only 14% give him favorable marks. Views of Zardari have turned sharply negative since he took office in 2008, only months after the assassination of his wife, former Prime Minister Benazir Bhutto. Then, 64% saw him in a positive light. Zardari’s ratings may be low, but his party can take credit for presiding over a significant achievement: making it through a full term in office. No matter who wins this weekend’s elections, it will be the first time in Pakistan’s history – a history checkered by several military coups – that a democratically-elected parliament will be followed by another democratically-elected parliament.